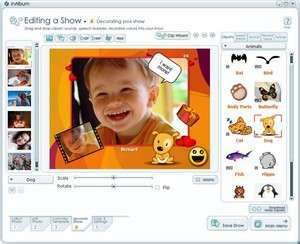 InAlbum Deluxe, formerly just InAlbum, is an album and slideshow creator for Windows which allows you to turn your collection of digital photographs in to a slideshow which can be burned on to a blank DVD or CD if you opt for Video CDs. InAlbum includes several different pre-made slideshow templates and the current count for that is around 300. Some of the templates included with InAlbum are better than others, though a lot of them are rather charming. InAlbum allows you to create your own templates and take elements from other templates in order to complete the look. InAlbum 4.06 is a shareware program and can be used as a demo to try the software until the free trial period has ended. A full version of the program is available after the trial period ends. For security reasons, you should also check out the InAlbum download at LO4D.com which includes virus and malware tests. Additional screenshots of this application download may be available, too.